“E.T.”, “Independence Day”, “The War of the Worlds”, “The Day the Earth Stood Still”, “First Encounter of the Third Kind”; these are all films that have portrayed contact with alien beings from outer space in different ways. Some of these films display a curious, confused, friendly intergalactic organism while some portray a hostile, angry, vindictive space creature. No matter how one may examine these extraterrestrials it’s undeniable that the event of such an arrival on Earth would display some interesting characteristics from our divided, emotional population. Talented director Denis Villeneuve, who directed the impressive “Sicario” last year, returns with another remarkable film called “Arrival”. The filmmaker utilizes the premise of a science fiction film, specifically the invasion angles associated with the genre, to craft a thoughtful and tender film about communication, love, and the human condition. 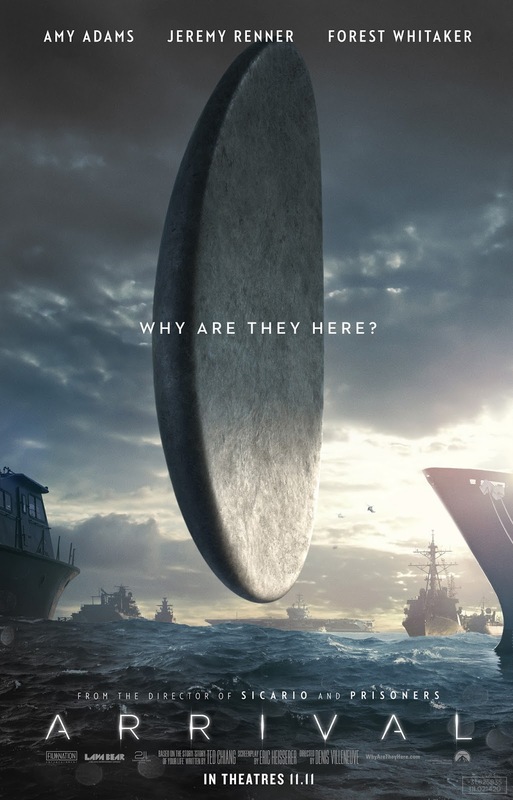 It’s an incredibly well thought out film that displays the power of genre film and how, in talented hands, a story about extraterrestrials unexpectedly arriving on Earth can also be an incredibly artistic endeavor. 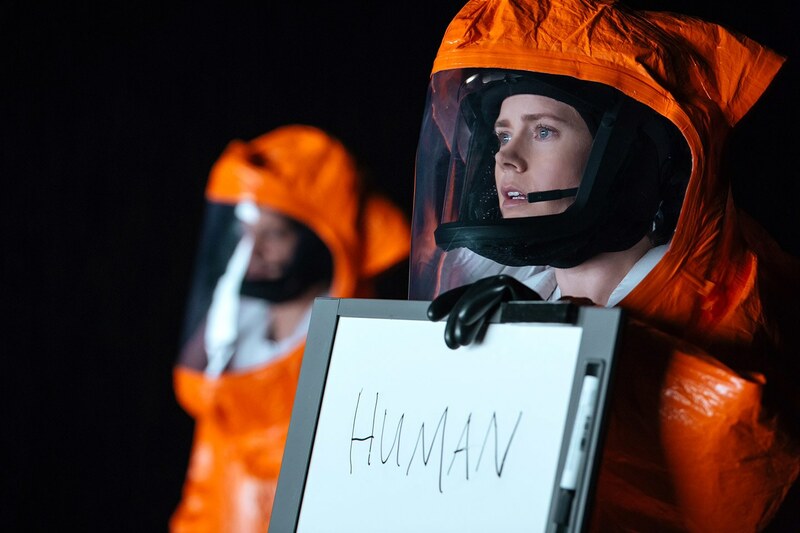 Dr. Louise Banks (Amy Adams), a linguistics expert, is teaching at a college when the world is disrupted by the arrival of alien spacecrafts that position themselves all across the globe. Dr. Banks is called to assist the government in establishing communication with the alien visitors; assisting her is a theoretical physicist named Ian (Jeremy Renner) and an army Colonel (Forest Whitaker). Once on board the ship the team must decipher a language in order to figure out the purpose of the extraterrestrials while the world around them grows progressively more hostile towards the unexpected visitors. This broad synopsis is all you need to know about the story going in. It may be the best way to approach this film experience. 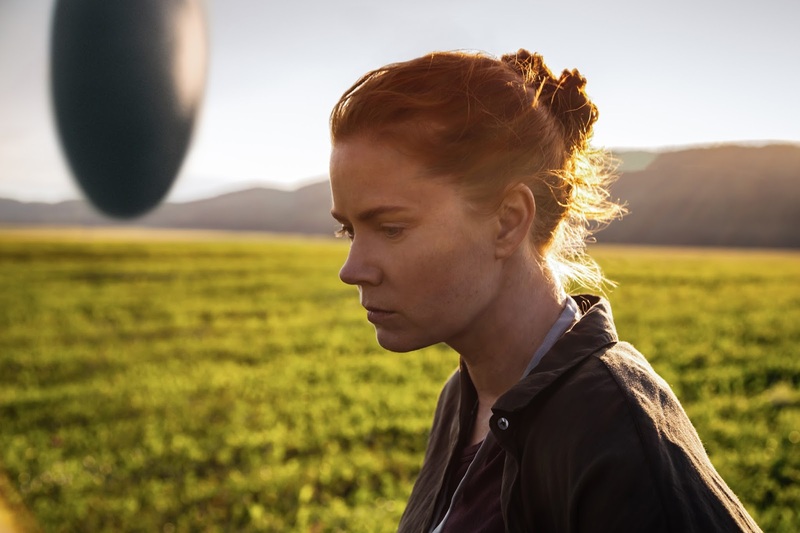 “Arrival” does a great job of creating a detailed and complex, yet completely accessible, narrative. However, its biggest triumph is the genuine and heartfelt emotional experience that is organized along the way. Communication and language play vital roles in the composition of the film, specifically how humans communicate with each another and how they communicate the emotions that motivate their every decision. There is a strong aspect concerning language and how it is used to provide structure in the way we examine history and comprehend the future. The characters composed in the film beautifully explore these aspects, specifically the sensitive construction of Dr. Banks played by Amy Adams. Ms. Adams conveys a character restrained by emotion yet motivated towards the process of connection. How can you have a genuine connection without emotion? It’s a compelling contrast that is expertly crafted by the actor. 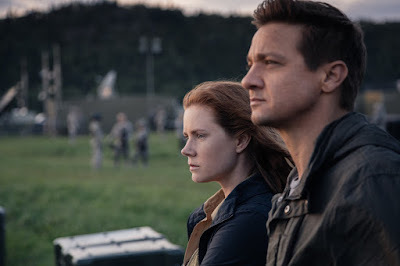 Jeremy Renner’s character also brings an important component to the film; the actor’s character is looking for an explanation grounded by some sense of logic, it’s a great character to utilize in the science fiction genre. Influencing all these narrative and character aspects is the astute direction of Denis Villeneuve. The director continues to grow with every film that he orchestrates, here again displaying the themes of the film through every aspect of the filmmaking process. Mr. Villeneuve connects with director of photography Bradford Young in composing a world filled with images that build an atmosphere of disconnection that is reproduced in the characters. This is utilized in a variety of ways, either with tight close-ups that blur the world around the character or with singular shots that correlate to the loneliness experienced by the barriers imposed with humanity and with the aliens trying to communicate. “Arrival” is an impressive experience; a film that is more about the human connection and less about the aliens and the ominous spacecrafts. It’s a film that subverts the science fiction genre in ingenious fashion, avoiding formulaic conventions while utilizing genre characteristics in intelligent ways. It’s a film that boldly goes beyond the contemporary expectations that usually defines the genre.